La Raza Unida Party’s National Convention 40 Years Later: Time for a Third U.S. Political Party? Forty years ago on Labor Day weekend (Sept 1-5, 1972), two months before the Richard Nixon/George McGovern presidential election, a call was issued by Reyes Lopez Tijerina, Rodolfo “Corky” Gonzales, and Jose Angel Gutierrez, for a national convention in El Paso, Texas. 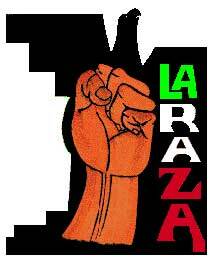 The purpose; to create a national political party for Chicanos… La Raza Unida Party (LRUP). Numerous individuals from San Diego joined thousands of others from thru-out the U.S. to journey to El Paso to attend and partake in the convention. At that time Chicano movement activists perceived the convention as being the most important political event to be ever be organized by Chicanos in the history of the U.S. Over 3,000 Chicanos from 18 states, the majority from the Southwest, but some as far away as Washington, D.C., Maryland, Rhode Island, Minnesota, Illinois, Wisconsin and Nebraska convened at the historic national convention to discuss strategy and policy to create the new national Chicano political party. The convention represented at that time the broadest based number of Chicanos to attend the largest political gathering of our people in U.S. history. Aside from addressing the creation of a national political party, attendees also discussed issues/problems that have historically affected our people in the U.S. The principal reasons for the massive turnout and convening of the convention (I believe) was because of the deep historical anger felt by Chicanos against both the Democratic and Republican parties. The pent up anger was especially virulent against the Democratic Party. A party that our people had supported and blindly voted for, since the 1930 depression era election of Franklin D. Roosevelt. Anger was even more virulent against the white controlled Republican Party that was anathema to our people for its historic racism against Mexicans, blacks, other minorities and working people. To understand the call for the creation of LRUP in the U.S., one has to review Chicano political history. One has to remember that outside of Texas and New Mexico (that have elected Governors and U.S. Senators) that up until 2012 Chicanos have only been politically involved for 52 years, while Anglos have been involved for hundreds of years! California and other states with large Mexican American populations had no statewide or local political representation. Those were the reasons for the Mexican American Political Association (MAPA) being organized in 1960 by Humberto “Bert” Corona, Ed Roybal and Juan Quevedo. At its inception MAPA was nonpartisan, with objectives of electing Mexican-Americans to political offices, caring out voter registration drives, bringing out the vote during elections, and endorsing Democrats, Republicans, Peace and Freedom, etc., candidates for public offices. In 1968 when most of us in San Diego and other areas of California became involved politically with the Chicano movement, it was thru MAPA. In 1968 we in National City (NC), CA organized a MAPA Chapter. However, even at that time the political facts were that after eight years of MAPA being in existence, not one Mexican American had (since the late 1800’s) been elected to a California statewide office, only one Mexican American (Alex Garcia from Los Angeles) elected to the state legislature, and in San Diego County one Mexican American elected, Louie Camacho from National City. During that period many MAPA members participated in electorate politics in SD County, but soon became disillusioned due to the inherent discrimination and racism that they encountered in the Democratic Party. Particularly aggravating to Chicanos was the Democratic Party’s failure to address issues affecting the Mexican American community, and assist/support Mexican-American candidates for public offices. MAPA, after attaining some of its political objectives unfortunately changed, and ended up as an, “endorsing political organization,” mainlyfor Democratic Party candidates. By1971 National City MAPA activists had come to the conclusion that the Democratic and Republican parties were not going to change, or provide the needed solutions to the issues/problems afflicting our people in California, and other states. It was at that time that Texas LRUP founder Jose Angel Gutierrez visited our office in National City. After meeting and talking to him, a vote was later taken by MAPA members to start a political chapter of LRUP in San Diego County. Bert Corona was then LRUP national organizer. The SD County Chapter of LRUP set a goal of registering 10,000 voters to meet the required 67,000 voters needed to become a statewide political party in California. The stated goal of SD County LRUP organizers was that once 10,000 voters were registered, a convention would be held and those voters would provide organizers with a mandate to determine what kind of political party they wanted to create. Either a vanguard party as proposed by Colorado’s Rodolfo “Corky” Gonzales that would build power to create a, “nation within a nation” Aztlan. Or an electoral party that would control cities, counties and states politically where Chicanos were the majority as Texas Jose Angel Gutierrez proposed. Unfortunately after years of ideological battles and infighting, that LRUP was unable to overcome, the concept of organizing a third political party to control the politics of our communities’ had to be left to a future generation. This coming Labor Day weekend, participants (after forty years) will again meet in El Paso. Not just to commemorate the 1972 convention, but also to address the fundamental issues of our people’s historical political disenfranchisement. The question for those in attendance will be numerous, but one of the major questions raised will be, what role did LRUP play, or will play in the political future of this nation’s fastest growing population? In my opinion, after having participated in both electoral and movement politics, the legacy that LRUP leaves is numerous, it includes the following political concepts, A) The first to utilize the principal of self-determination to create a political party for our people, that would be controlled and accountable to our people, B) A call for our people to build “political power” to control their destiny C) Political philosophies and ideologies to create mandates, a constituencies and an infrastructure so our people could define issues that affected them, and so they would be able to select and elect their own candidates, etc. In closing, one thing that no one can dispute is the demographic change of the last 40 years…50 million Chicano/Latinos in 2012, projected to increase to 132 million by 2050, and that both the Democrats and Republicans parties continue to fail to represent our people. The Democratic Obama administration has deported record numbers of undocumented Mexican workers, and Republicans have literally “declared war” on our people, with draconian measures such as Arizona’s SB 1070, the elimination of Chicano studies, etc. In conclusion the question for all attending the commemoration in El Paso will certainly be…do 50 million Chicanos/Latinos need to create a third political party like La Raza Unida in 2012? Herman Baca is a longtime Chicano activist, political organizer and President of the Committee on Chicano Rights (CCR). He has chronicled more than 40 years of San Diego’s Chicano Movement.